Researchers at Queen's University's Human Media Lab have developed the world's first full-colour, high-resolution and wireless flexible smartphone to combine multitouch with bend input. The phone, which they have named ReFlex, allows users to experience physical tactile feedback when interacting with their apps through bend gestures. "This represents a completely new way of physical interaction with flexible smartphones" says Roel Vertegaal (School of Computing), director of the Human Media Lab at Queen's University. "When this smartphone is bent down on the right, pages flip through the fingers from right to left, just like they would in a book. More extreme bends speed up the page flips. Users can feel the sensation of the page moving through their fingertips via a detailed vibration of the phone. This allows eyes-free navigation, making it easier for users to keep track of where they are in a document." ReFlex is based on a high definition 720p LG Display Flexible OLED touch screen powered by an Android 4.4 "KitKat" board mounted to the side of the display. Bend sensors behind the display sense the force with which a user bends the screen, which is made available to apps for use as input. ReFlex also features a voice coil that allows the phone to simulate forces and friction through highly detailed vibrations of the display. Combined with the passive force feedback felt when bending the display, this allows for a highly realistic simulation of physical forces when interacting with virtual objects. "This allows for the most accurate physical simulation of interacting with virtual data possible on a smartphone today," says Dr. Vertegaal. "When a user plays the "Angry Birds" game with ReFlex, they bend the screen to stretch the sling shot. As the rubber band expands, users experience vibrations that simulate those of a real stretching rubber band. When released, the band snaps, sending a jolt through the phone and sending the bird flying across the screen." 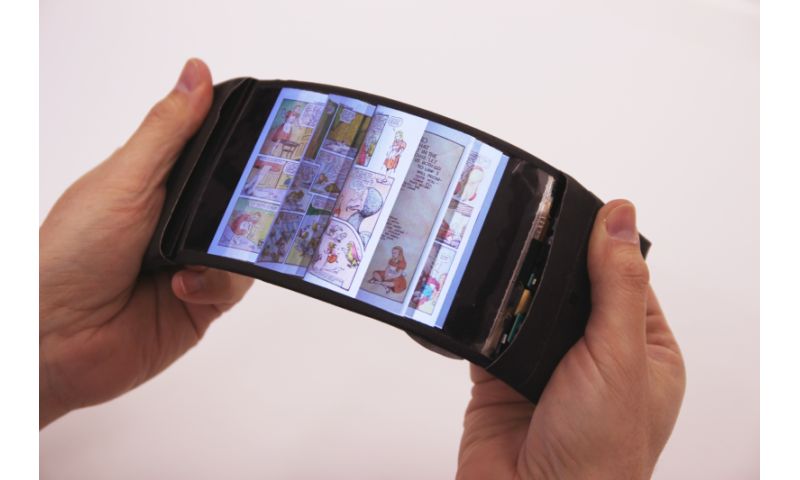 Dr. Vertegaal thinks bendable, flexible smartphones will be in the hands of consumers within five years. Queen's researchers will unveil the ReFlex prototype at the tenth anniversary Conference on Tangible Embedded and Embodied Interaction (TEI) in Eindhoven, The Netherlands on February 17. The annual forum is the world's premier conference on tangible human-computer interaction. Apart from a watch, I don't personally see why I might want to use a bendable display. Didn't iPhone6 invent the bendable display?